The contact belt grinder KS 100 is the universal all-rounder among the belt grinders with a myriad of possibilities to adapt to the workpiece being machined. An extensive variety of technically mature grinding attachments developed over the years, covers virtually every grinding task in a wide range of applications. In addition to highest quality, value was also placed on ease of handling, so that learning time on the belt grinder is extremely short. The contact belt grinder’s KS 100 patented three-roller-system reduces the motor strength by approx. 30% compared with conventional two-roller-bench grinders. The contact belt grinder’s KS 100 three-roller-system also ensures a constant, optimum belt speed for abrasive belts with lengths from 3.000 to 4.000 mm for every contact wheel diameter available from Picard. 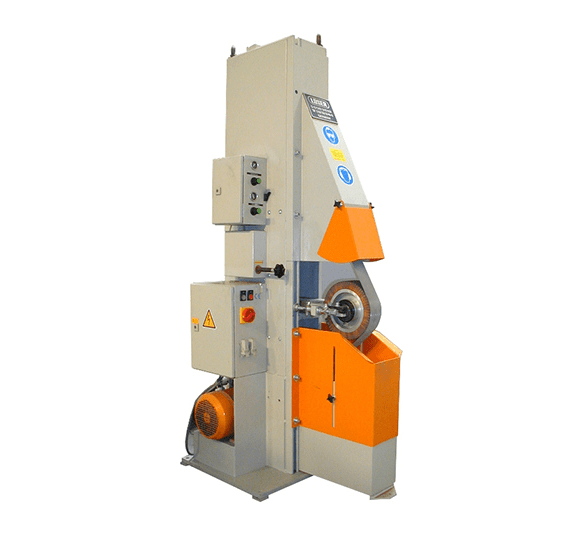 The contact belt grinder’s KS 100 stability ensures vibration-free operation. 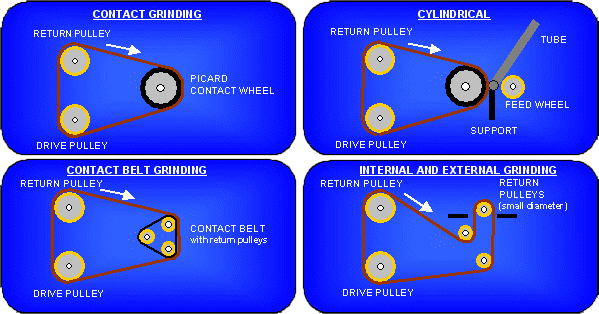 The drive can be controlled continuously for speeds starting at 3 m/s for work with non-woven abrasive fleece belts, felt polishing belts, satin finishing wheels, Scotch-Brite wheels, etc. Drive pulleys with diameters from 100 to 280 mm provide the right belt speed for a certain workpiece in a range from 11,0 m/s to 42,0 m/s. By adjusting the cutting speed with the drive pulley, the contact wheel’s diameter is completely independent. Compared with conventional two-roller-bench grinders, at equal motor power, the contact belt grinder’s KS 100 three-roller-system provides greater machining capacity. The protective devices and the protective steel hoods satisfy the most current regulations and are subject to constant monitoring. Compliance with legal requirements is a matter of course for us, and is just as important as the long-term, focused high manufacturing quality of our products. We have different grinding attachments for different working steps available.